Brighten a child's life and inspire young people to shape a just and healthy world — what better way to honor friends, family, and colleagues. 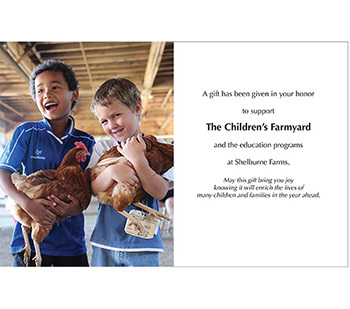 For birthdays, holidays, or any occasion, consider giving the Gift of Joy & Learning — a special contribution to support the Children's Farmyard and our programs that educate for a sustainable future. Make a contribution and you'll receive a beautiful gift card, or multiple cards (suggested minimum donation is $20 per recipient), that you may personalize and send to your friend or loved one.